This pub is located in the area of Edmonstown Road. It is the only pub in Ireland entirely managed by musicians. Every night they have a two hour music and dancing show put on by professionals. Their live events have been given the certificate of excellence for the Best Dinner/Entertainment Event in Ireland. The bar is currently the recipient of the award for “Best Music Pub of the Year” in all of Ireland. 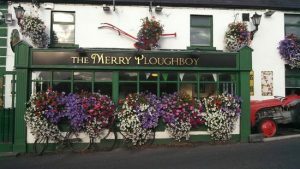 The pub is owned by the band The Merry Ploughboys who play frequently within the venue. For fans of the band this is a must visit destination when in Dublin. The bar is located just twenty minutes away from Dublin city centre. This is ideal for those want to commute easily or experience the rest of Dublin before going to the pub. Due to the location it is also the perfect spot to go to after a long shopping trip. The food has been lauded by critics and customers alike for being delicious. The menu is varied and set at a reasonable price. It has the distinction of being popular with both locals of the area and tourists who are visiting. When Dublin natives visit a pub frequently you know that it is of high quality. The broad appeal thanks to the Irish music, good food and selection of drinks means that there is something for everyone. It is appropriate for all age groups. This means that the spot is perfect place for families to drop off at when they want dinner and a show. For those without a car or those who want to enjoy an alcoholic beverage a shuttle bus service is available to ensure that customers can get back their places of accommodation safely and in good time.